Paving with strict measures to increase investment value. Fixing a bad paving situation. There are many things to take into account when pricing a paving installation for a driveway or pool area or even just a pathway. Most people just get the price from someone like a company salesman and then decide who is the cheapest without considering why one company is a little more expensive than another. In some cases it could just be a company’s policy and marketing that determines costs but often it is the quality of the materials used in the installation. Grey bevel bond with a charcoal border. Bricks make up 50% or more of the paving costs and this is dependant on the selection. There are bevel bonds, flagstones, clay and broken brick cobble, all of which are priced differently. Cement has various grades and the selection of cement grade can also effect the durability and life of the installation. River sand and plaster sand is used for bedding the paving and the grouting. River sand is also used in the edgebeam or also know as the perimeter brick. Compaction equipment is critical in the installation as the area to be paved needs to be leveled and compacted to the correct density to ensure that the installation will not have areas that sink and create waves in the paving. Cutting disks and a good grinding machine is needed to cut or trim the bricks where needed. Labour is critical and can often be overlooked. Labour that is experienced and is permanent staff to the contractor can more often than not install paving that will last a lifetime. Then finally there are the delivery costs which vary depending on the distance the manufacturer or supplier is from the delivery point. An area that is often forgotten about is the water drainage. Unfortunately there are short cuts to everything mentioned above, cheap non guaranteed bricks, inexperienced installers, cheap materials and broken machinery. Always get a paving company to install your paving to ensure that your money is well spent and your paving will stand the test of time. Paving around a swimming pool can be a major investment or a major failure and it all depends on the brick selection. Dark colour bricks get too hot to walk on during the hot summer days and it is always best to get a very light coloured paving brick around your pool. There are many different brick types available and every type comes in a variety of colours, so you are not limited regarding choice but rather by colour. Even after discussing this subject with customers we have installed Red, Charcoal and other dark colour flagstones and paving bricks only to hear from others in our industry that they went to replace the paving after a year or two. Cederberg is an all time favorite around most swimming pools. All paving should become an asset to the property and by following expert advice, your paving can and will increase the value of your property. Spend a little time examining the options available and test the company that is quoting to do your paving to ensure that it will be installed correctly. A good salesman that is knowledgeable in his/her industry will offer sound advise but the final decision is always with the customer. Mrs.Zukosi of Alberton had a major water leak which shot her water bill into the 5 figure mark. After getting a plumber to sort our the problem and paying a small fortune, she still had a problem with her paving. The plumber replaced the paving, got paid and left however, 3 days later when everything settled, the paving was an eyesore and she phoned the plumber who politely told her that they only fix plumbing problems and not paving. After a lot of frustrating worrying she decided to call a paving company and settled on calling us. Mrs.Zukosi is now a very satisfied home owner as the water problem is gone and we re-installed the paving in such a way that it looks like it was never touched. The only noticeable factor is the new bricks which will fade and blend in after a short while. If you ever have your paving lifted you should call a paving company to assist you rather than expect a quality paving installation from a non paving expert. 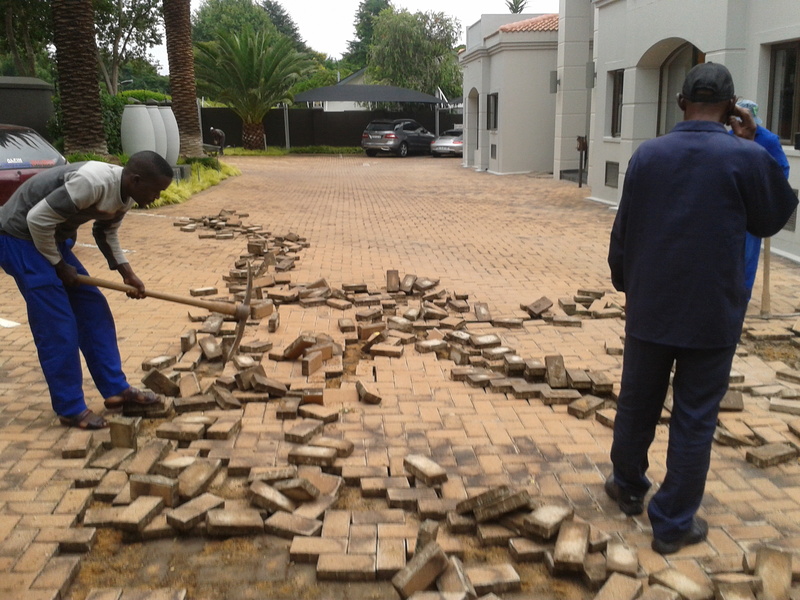 We are currently busy with a 350m2 driveway in Bryanston that needed to be uplifted and then repaired. Many home owners don’t realise that their existing paving can be re-used and the driveway or pool area can once again look good at a fraction of the price of new paving. There is a lot of work removing the old grouting from the paving but the end result both from an aesthetic and cost point of view is well worth it. Get a professional and honest quote from us before tackling that paving installation. Often home owners replace their paving when in fact they could save a fortune by getting the existing paving uplifted and relaid correctly. Have a look at the condition of your existing paving bricks and you might find them still in perfect condition and only a few are broken or damaged. 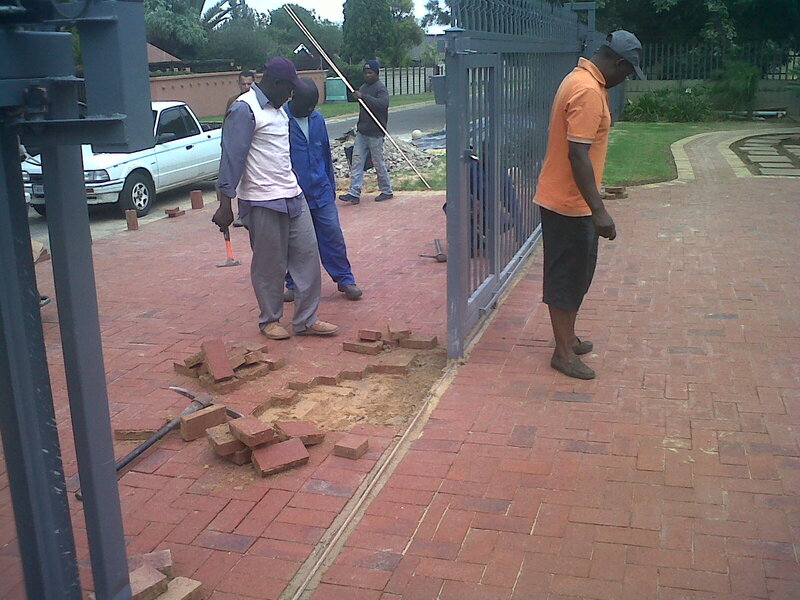 Old bricks being relaid after levels were corrected. We normally work on replacing roughly 15% of the existing bricks due to damages but that means 85% of your existing bricks are re-used and has saved you a small fortune. In most cases the initial levels and compaction were not done correctly which then creates a distasteful image in a short time. New bricks being spread among the old paving bricks. The new bricks can either be used as the new border or we can scatter the new bricks in among the old bricks so that patches of old and new are avoided. So before you replace your paving get a quote to repair your existing paving. You might still go ahead with the new paving but you have at least had a comparison quote. Lapa and lapa repairs There has been a spate of lapa repairs recently and mostly due to poor installation. Even though most lapa companies buy the grass and the poles from the same suppliers, it is the shoddy workmanship that comes out after a year or so. We often get calls to repair Lapas after a heavy downpour more so when there is a heavy hailstorm. I must add though that in 90% of cases the repairs come only after 5 years when the grass normally needs combing and replacing which is normal maintenance. Once repaired and the paving has been either cleaned or replaced then the lapa/ entertaining area is again ready for summer or a warm winter day. 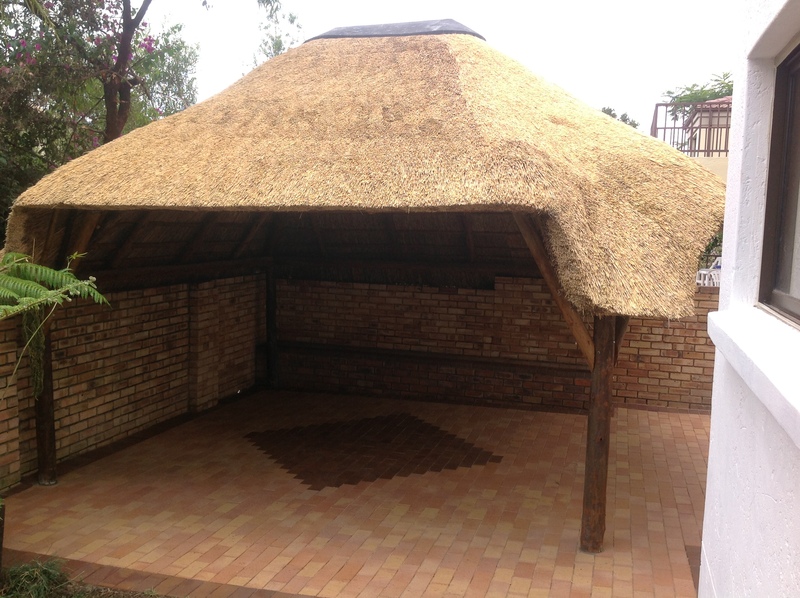 the nice thing about a Lapa is that it is one of the most cost affordable entertaining areas to build. Is your Paving infested with grass? There seems to be a massive invasion of grass on a lot of driveways and paving in general this year. I have noticed that our church’s driveway and numerous clients driveways have grass taking over in massive quantities. In most cases it is a maintenance problem which is quite simple to remedy. Grass and weeds destroying paving. Bevel bond paving with grass growing on the driveway. This is a sure fire way of destroying your paving if left unattended and then costing a lot of money to either fix or replace the paving. Never leave any small weed or grass pieces for too long as they just multiply and then lift the paving to the point where the paving needs to be replaced at a high cost. Ironstone paving cleaned from weeds and grass. A simple maintenance solution is to wash and sweep your paving once a month with a gentle water flow and a normal house broom. This will get rid of any seeds laying on your paving before they germinate and start growing. I strongly suggest that you attack any problem with a strong weed killer and monitor the paving on a twice weekly basis until the grass problem is solved. Do not ignore this problem as it will destroy your paving and cost you a fortune to replace the paving. Corobrick paving with grass growing over it. 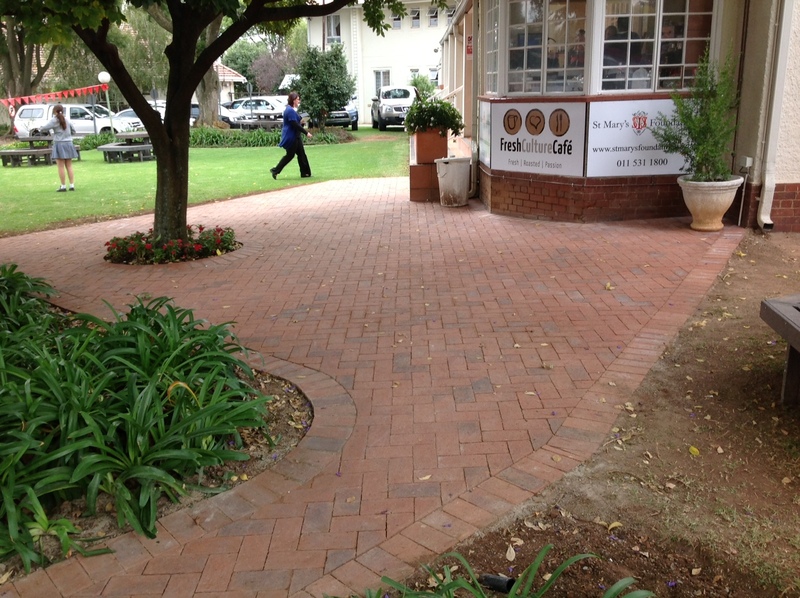 Home owners as well as corporate are seeing the value of re-using the old bricks at their premises. 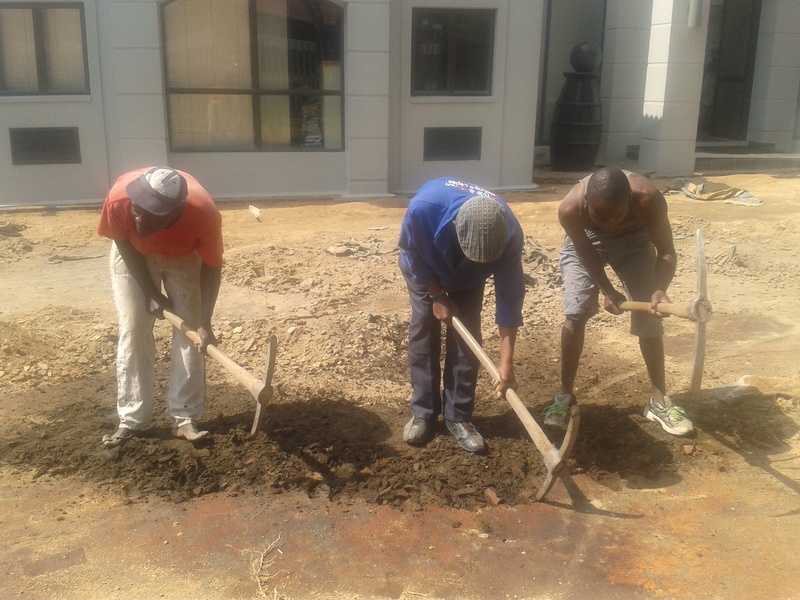 We have just finished lifting and relaying paving in a Brackendowns house and then recently we did a huge uplift and relay at lawyers premises in Bedfordview. The cost of relaying paving is a bit less than half price when compared to brand new paving bricks. The preparation work and the laying of the old bricks is done exactly the same as when using new bricks. There is normally between 12% and 20% of the old bricks that are lost due to breakage and new bricks are then needed to be brought in to replace those broken bricks. Preparing the ground for water levels. The new bricks do stand out initially but soon fade, they get dirty and then match the existing old bricks. So if your budget is a bit on the low side then consider getting your paving reconditioned. The old bricks are lifted, the old grout is cleaned off, the ground is re-scarified, levels are re-set, compaction is then done before river sand is laid and the bricks are then laid with a new edgebeam. 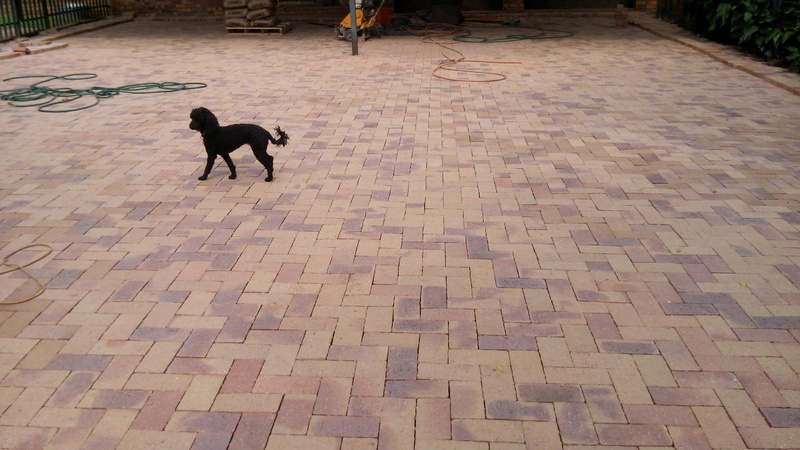 BINGO, you have a new reconditioned driveway with your old bricks. We have done paving in most suburbs in the greater Gauteng and we will include an article with most of our installations from now on. Recently we paved in Brackenhurst, Roodepoort, Brackendowns, Weltevreeden park, Midrand, Springs, Boksburg, Horizon, Alberante, Glenanda, Edenvale, Eastleigh and Newmarket. 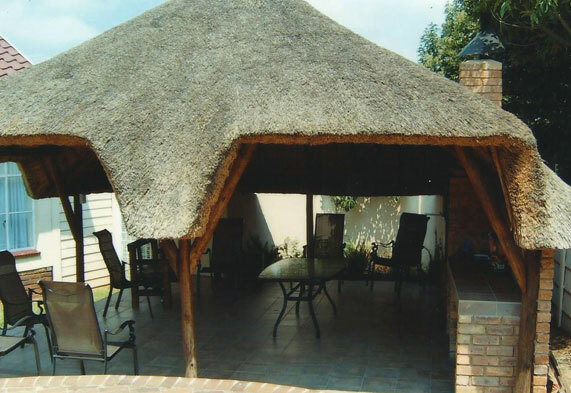 In most of the paving mentioned above we paved using Corobrick products however, we do also pave with Flagstones and Bevel bonds in all of Gauteng. It is our policy to give a client advice regarding which paver would best suite the area that is to be paved but we will pave using any brick or paver preferred by the client. Most clients do not know what is the costs to do paving today and I like to suggest that home owners try estimate the size of the area to be paved and get a telephone quote before inviting a salesman around to measure accurately and giving a formal quote. I also suggest that a paving quote be done early in the construction of a new house as it would need to be budgeted and not left as the last thing to be considered. Often a home owner will settle for cheap paving as their budget is exhausted but within a couple of years the paving needs to be re-done due to poor selection or poor installation. There has been a spate of lapa repairs recently and mostly due to poor installation. Even though most lapa companies buy the grass and the poles from the same suppliers, it is the shoddy workmanship that comes out after a year or so. Once repaired and the paving has been either cleaned or replaced then the lapa/ entertaining area is again ready for summer or a warm winter day. 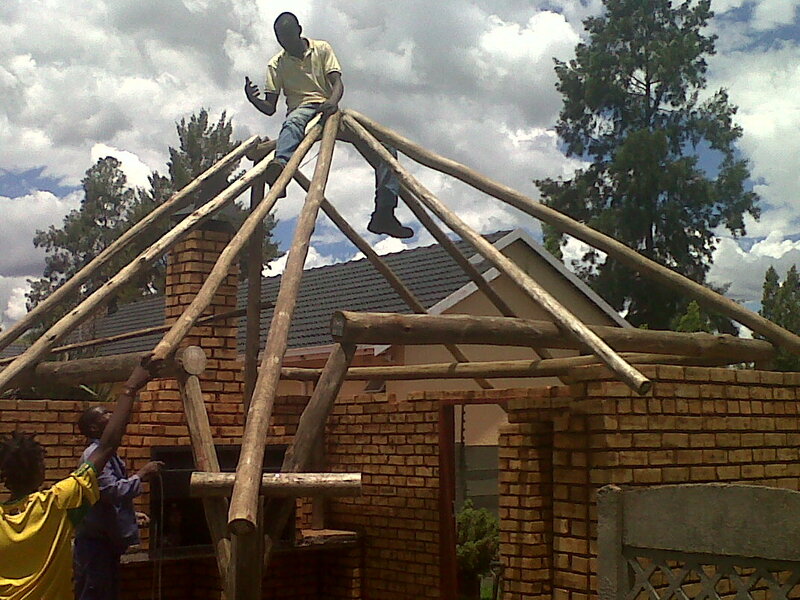 the nice thing about a Lapa is that it is one of the most cost affordable fun areas to build. We have the expertise to undertake all paving jobs, from residential driveways to shopping centre parking lots, we have the resources and the expertise to handle large and small jobs alike. We also fix and repair old paving issues. Is your paving falling apart?